Comfort & energy problems are caused by attics with too little insulation and too much air leakage. Autumn’s official arrival has many of us reaching into the back of the closet for coats and sweaters that may soon get put to use. Getting reacquainted with cold weather clothing is a good reminder that houses also need insulation to keep the heat inside during cold winter weather. The attic is usually the top priority for insulation and air-sealing upgrades that can make your home more comfortable and less expensive to heat and cool. You don’t have to be a home energy analyst to identify the improvements your attic needs to help make “cold” rooms warmer and reduce heat loss due to air leaks and inadequate insulation. If your attic is accessible through a hatch, drop-down stair or regular stairway, you can check for any of the 8 conditions described below. Real-world tests have shown that attic insulation and air-sealing upgrades can cut heating and cooling costs by as much as 40%. This amounts to saving hundreds of dollars a year for most households. Every “can” light that is visible in the attic is a major source of air leakage and heat loss. This is especially true for commonly used “non-IC” fixtures that shouldn’t be in contact with insulation. Fortunately, there’s a fix for this problem: specially designed can light covers that enable a technician to seal air leaks and install insulation around and above the light fixture. In some attics, plywood or other sheathing is installed over attic joists. While this provides valuable storage space, it also limits the amount of insulation that can be installed to reduce energy losses. A skilled energy upgrade contractor can remedy this problem by building up the floor level to allow for more insulation. 3. Missing or damaged insulation. Before your attic visit, check out the ENERGY STAR® attic insulation recommendations for your geographic region. In the Northeast, where I live, many attics still have the minimal amount of attic insulation installed by the builder –typically fiberglass batts with an R-value of R-20 or less. 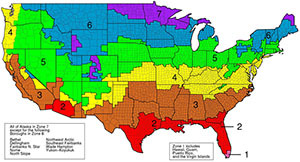 In contrast, ENERGY STAR recommends that attics in my climate zone be insulated to between R-49 and R-60. While you’re checking the insulation level in your attic, also check for wet or compressed insulation that should be discarded. 4. Mold on rafters & roof sheathing. Can you see dark, blotchy stains on wood rafters and sheathing in the attic? This is an indication of air from your living space leaking into the attic. During cold weather, warm air that leaks into the attic will give up its moisture when it hits a cold attic surface (typically rafters and roof sheathing). The dampness from this condensation often attracts mold spores –a precursor to wood rot. In addition to creating a mold problem, air leakage into the attic means that your living space is losing heat, which isn’t a good thing in the winter. The fix for this problem is to have your attic professionally air-sealed –an upgrade that should be done before any additional attic insulation is installed. Building codes require wood framing to be at least 2 in. away from any chimney that serves a fireplace, woodstove or combustion appliance. Unfortunately, the resulting air space can create a major escape route for the “conditioned” interior air that keeps you warm in winter. Experienced home energy technicians know how to seal this major “thermal bypass” using sheet metal, fire caulk and mineral wool insulation. 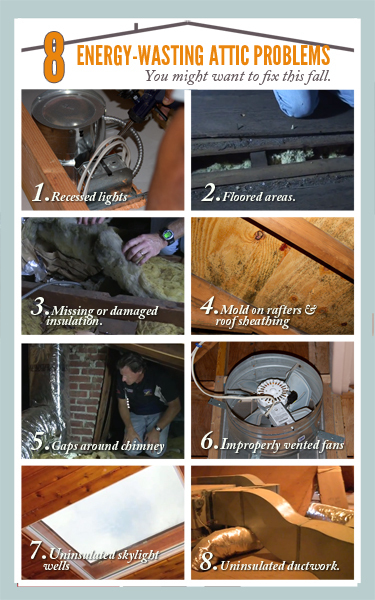 Ceiling-mounted bathroom fans are sometimes incorrectly installed –dumping warm, humid air into the attic rather than through ductwork to the exterior (another cause of the attic mold described in #4, above). Make sure that any bathroom fans that extends into the attic is well-sealed to the gypsum board and ducted to the exterior. A butterfly valve in the duct run is recommended in order to prevent cold exterior air from leaking into the bathroom when the fan isn’t in use. If you can see the wood framing and gypsum board facing of a skylight well in your attic, it means that you need to insulate the four sides of the skylight well with rigid foam. Otherwise, the only thing separating your living space from frigid attic temperatures is ½-in.-thick gypsum board. What happens when you blow heated air through a duct in a frigid attic? That’s right: The air you’ve paid to heat gets chilled before it reaches its destination. Your HVAC system has to heat the duct before it can effectively deliver warm air to your living space. Fortunately, this problem can be solved by installing duct insulation. Final note: If all of these attic energy problems seem discouraging or overwhelming, don’t despair. One way to get an expert attic diagnosis is to have an energy audit done on your house. Home energy contractors like Dr. Energy Saver are specially trained to identify the weak areas in home energy performance and make targeted repairs that will permanently solve most comfort and energy problems. Good post. I used to be looking at consistently this site for empowered! Extremely helpful info specially the greatest component 🙂 We keep these kinds of facts much. I was in search of this specific specific info for any while. Cheers and greatest with fortune.